The fed funds futures market is assigning a 47.8 percent probability of at least one rate cut by Jan. 29, according to the CME’s FedWatch tool, which has been a reliable gauge of the Federal Open Market Committee’s actions. Futures contracts are also implying a 39 percent probability of a rate decrease by Dec.11, up from only 23 percent before the Fed’s policy decision at 2 p.m. EDT on Wednesday. The Fed left interest rates unchanged Wednesday and also indicated that no more hikes will be coming this year. The central bank’s policymaker took a sharply dovish turn from policy projections just three months earlier when it estimated two rate hikes would be appropriate in 2019. “They did what they needed to do to convince the market of their dovish pivot in messaging,” said Jeff Mills, co-chief investment strategist of PNC Financial Services Group. “The very important thing along that pivot and the downgrade of the economy is that they also need to take some effort to convince the market that the economy is still on reasonably stable footing. 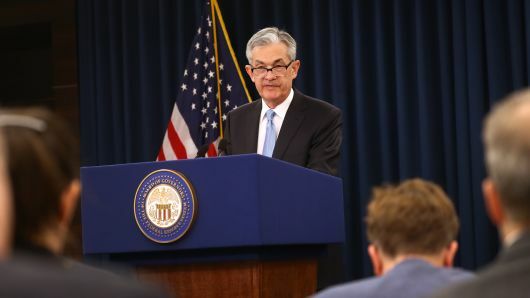 I think there’s a balancing act going on with the dovish policy pivot and making sure they are not making investors think the economy is in worst shape than it is,” Mills said.